A campaign to fund the creation of a memorial to Mary Wollstonecroft. Newington Green Action Group has launched a campaign to raise funds for a memorial to Mary Wollstonecraft on Newington Green. Since the launch the campaign has gained the support of over 70 MPs and peers & the TUC and has featured on Woman’s Hour. MARY on the GREEN is a campaign, organised by Newington Green Action Group, to raise funds to erect a memorial to Mary Wollstonecraft (1759-97), founder of the campaign for the freedom and equality of women, on Newington Green, London, N16. Mary Wollstonecraft moved to Newington Green in 1782 where she lived and set up a girls’ school. After publishing books on girls’ education and civil rights, she went on to write A Vindication of the Rights of Woman (1792), demanding “JUSTICE for one half of the human race”. 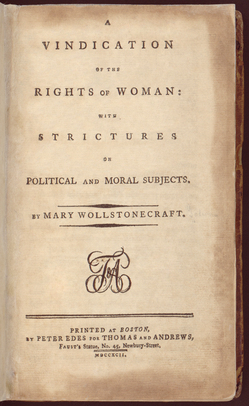 The book would become a foundation in the history of women’s rights and Mary Wollstonecraft is now regarded by many as the mother of feminism. She was also an innovative educator, a political philosopher, a war correspondent and an early anti-slavery commentator, whose works are still quoted today. Despite her contributions, there is no significant memorial to her anywhere in the world. Newington Green Action Group has decided to rectify this situation and with local community support has initiated a campaign to erect a sculpture on Newington Green to recognize her achievements. Newington Green Action Group (NGAG) is a registered charity and a grassroots organisation with a track record of significant achievement. Formed in 1997 to revitalise the historic but neglected village green, on the Islington and Hackney border, London N16, major regeneration works were completed in 2004. Or by sending a cheque, made out to ‘M W Memorial’, to Mary on the Green, Newington Green Action Group, 73b Leconfield Road, London, N5 2RZ, UK. [The image is a photograph of the first page of A Vindication of the Rights of Woman by Mary Wollstonecroft. It has been digitally restored and is in the public domain]. There has been some very good news recently: Historic England has now officially recognised Newington Green Chapel for its role in the Nonconformist movement and its links with early feminism. For details, visit http://www.new-unity.org/. The chapel is near Canonbury station.